Mister Rogers arrives with a box which has been taped shut. After showing two different kinds of scissors, he uses one pair to open the box and reveal a wide variety of everyday items -- paper cups, spools, string, tape, and a tongue depressor. Mister Rogers takes these items to the kitchen where he uses his imagination to come up with things he might make out of the items. He then sings Everybody's Fancy. In the Neighborhood of Make-Believe, Bob Dog is on the mend as he uses crutches to get around. He and Lady Aberlin attempt to convince King Friday that the no-play rule is unreasonable as the Neighborhood children have set up a playground in Museum Go-Round's former location as their form of protest against King Friday's rule. Meanwhile, Lady Elaine Fairchilde and Barbara Russell enjoy each other's company as they play without worry; however, at the order of King Friday, Officer Clemmons comes to the play park in search of Lady Elaine. Back in the Neighborhood of Make-Believe, King Friday is unhappy about finding the playground full of happy "players" singing It's a Perfectly Beautiful Day. Prince Tuesday stands up to his father telling him that people need to play. 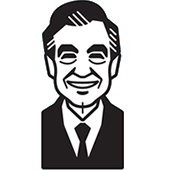 Returning to the house, Mister Rogers is invited to Negri's Music shop where he hears a fantastic musical demonstration by Johnny Costa and Lou Schreiber. Purchase this episode on DVD or digital download. 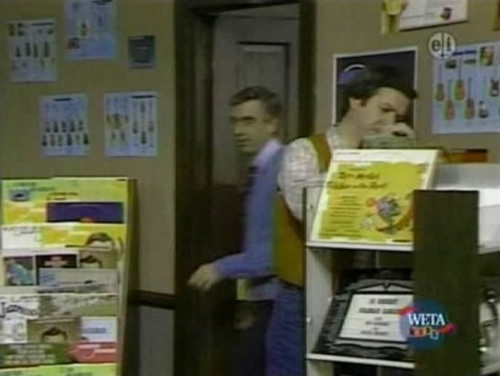 As Mister Rogers leaves the rehearsal room at Negri's Music Store, a rack full of Mister Rogers LPs can be seen on the left side of the screen. On the right, the rack includes a copy of the Fiddler on the Roof cast recording. After Make-Believe, the Trolley model on the kitchen table is seen to the left of the castle. When Mister Rogers returns from Negri's Music Shop, the Trolley is on the right side of the castle. Then, still without touching the Trolley, as Mister Rogers is cleaning up, the Trolley is back on the left. © 1981 Family Communications, Inc.